A Kings’ Ransom of Goaltending Riches in L.A.
A simple check of the leaders in save percentage amongst NHL goaltenders says a lot about the strength and depth of goaltending for the Los Angeles Kings this year. It’s good. Really good. Actually, it’s an embarrassment of riches. In fact, it may just be too damn good for their own damn good, if you know what I mean. You don’t? All right, I’ll explain in a minute. Goaltending has historically been in short supply in L.A.
It’s very odd for me to be gushing about the Kings’ strength between the pipes. Having been a fan of the team since the late 1970s, I can attest that the swirling vortex of malaise dooming the franchise to season after season of failure certainly included goaltending. 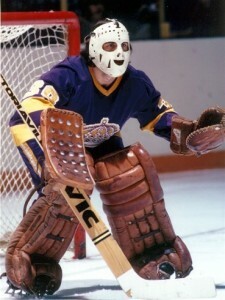 Granted, other teams can say the same thing, but Los Angeles made poor goaltending choices almost an art form. Anybody remember Mario Gosselin? Does the name Steve Passmore bring up visions of Patrick Roy? How about the goaltending train wreck that 33 games of Dan Cloutier represented, or the penultimate mediocrity of Roman Cechmanek? Frankly, over the franchise’s 47-year history, there have been a heck of a lot more versions of Dan Cloutier, circa 2006-07, than there have been of Rogatien Vachon. At least in part, that explain why the Kings made just one Stanley Cup Finals appearance between 1967 and 2011. 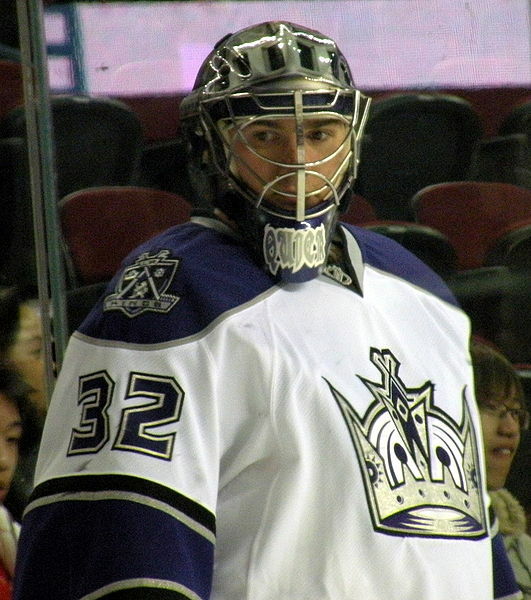 In the last year of former GM Dave Taylor’s regime, the team used the #72 pick to draft Connecticut-native goaltender Jonathan Quick. A short four years later, Quick had not only made the roster, but had wrested the starting role away from a typical bevy of mediocre goaltending incumbents. He’s never since surrendered starting netminder duties, signing a ten-year contract extension in the summer of 2012. The fortunes of the team rose in concert with Quick’s maturity. Although the Kings went 34-37-11 during his first full season and missed the playoffs for the seventh year in a row, they then exploded to a 46-27-9 record in 2009-10, capturing the sixth seed in the Western Conference in the process. The team has never since looked back, winning the Stanley Cup in 2012 and reaching the Western Conference Finals this past season. Admittedly, Quick hasn’t been at his statistical best since the 2012 campaign, posting mediocre stat lines of 2.45/.902 and 2.35/.905 over the past two years. However, he’s still a big-game, big-time goaltender and at 27 year old, is arguably just now entering his prime. Having said that, he’s on the shelf with a groin injury, forcing the Kings to play backup Ben Scrivens (acquired in the Jonathan Bernier trade). Surprisingly, Scrivens has taken the goaltending bull by the horns, registering a goals against average of 1.66 and a save percentage of .941 in sixteen impressive starts. And then there’s Martin Jones, the former Calgary Hitmen goaltender who spent three full seasons shining in Manchester, awaiting an opportunity at the big club. In the wake of the Bernier trade and after Quick went down, his chance came as Scrivens’ backup. Jones has not only held his own but arguably outplayed Scrivens (admittedly, in an even smaller sample size), posting a microscopic 0.99 G.A.A. and macroscopic .967 save percentage. With Scrivens an unrestricted free agent at the end of the season, the 23-year old Jones appears to be the backup of the future for the Kings. Overall, goaltending has never seemed in better long-term shape in L.A.
Rogie Vachon will always have a special place in the hearts of long-time Kings fans. When you’ve got as much goaltending as you do in Los Angeles, you have options. With Scrivens likely to capitalize on his rejuvenation with the Kings and test the free agency market next summer, it would seem plausible that Los Angeles might dangle him on the trade market and try to capitalize on his high value. Whether they do or don’t is anybody’s guess, but one thing is clear: when Quick is reactivated, there will be three very good goaltenders to fill just two slots on the roster. For now, that likely means Jones goes back to Manchester, who will get little benefit from further honing his goaltending skills in the minors. His time is now. There’s no question that Jonathan Quick is the long-term answer to the goaltending riddle for Los Angeles. The only uncertainty is whether or not backup Ben Scrivens or his backup Martin Jones is the one with the future behind Quick going forward. It’s a thorny-but-fine problem to have, one that this Kings fan would never have dreamed the team would be in the position to enjoy back when Glenn Healy was stinking up the joint during the late 1980’s or Jamie Storr was imploding during the early 2000’s. A Kings’ ransom, indeed. It’s still weird to say.